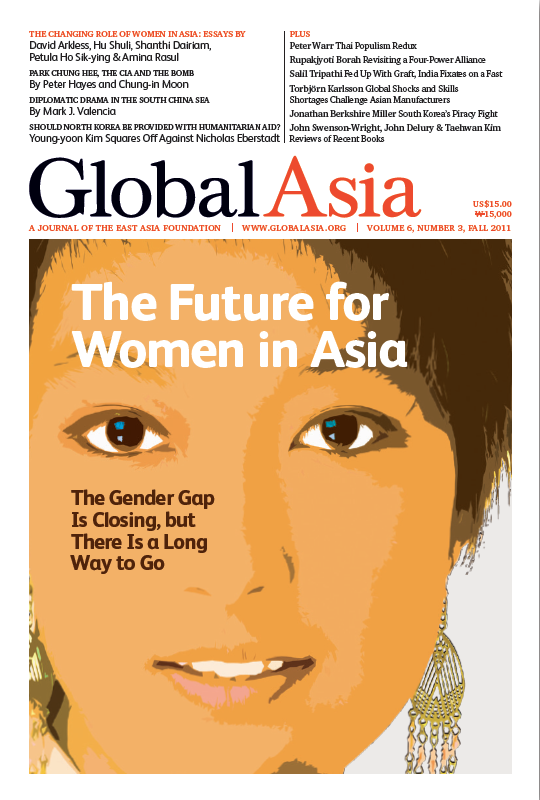 As the graphics that accompany the cover articles in this issue of Global Asia vividly illustrate, the gap between men and women across a broad array of metrics from employment to education and political participation to social standing is there for all to see. Moreover, in many areas, that gap is wider than in more developed parts of the world, suggesting that Asia must do more to mitigate the disadvantages under which women in this region now live and unleash the under-tapped potential women possess to add to Asia’s future prosperity, stability and well-being. To be sure, the role of women in this region is changing - largely for the better - under the pressures of economic growth and urbanization, carving out a greater voice for women as they move into more and more positions of power in business and politics. There are signs that both governments and the private sector are beginning to realize the vital contribution that women can make in helping to shape the region’s future. Nowhere is this more crucial than in the workplace, where the under-utilization of female labor sets Asia apart from developed countries in other regions and where women continue to toil in sectors where pay is low and the opportunities for exploitation are great. The ability to fully develop the skills of female workers is essential if Asia is to sustain the growth rates it has seen in the past. Also, the political systems in the region must open themselves up to more participation from women, if for no other reason than to bring to political discourse in Asia female values and perspectives that have often been ignored by male-dominated governments. Women in Asia, for example, continue to be victims of the scourge of human trafficking, often for the purposes of sexual exploitation. Would this be the case if there were more women in positions of political power? The changes in policies and mindsets that are necessary to closing the gender gap in Asia are not just a matter of fairness and justice, as our cover articles demonstrate, they are also a matter of ensuring that Asia continues to realize its full potential. Among the other articles in this issue of Global Asia we feature a groundbreaking report based on recently declassified documents from the US Central Intelligence Agency that cast new light on South Korea’s attempt to develop nuclear weapons in the 1970s. The documents, which have largely been neglected by scholars, show that the program continued for at least two years after the US thought it had been shut down. With some in South Korea again discussing a nuclear option, this article finds lessons for today from this earlier episode. As ever, we hope that you will find the articles in this issue valuable, and we welcome your thoughts and comments at editoral@globalasia.org. Across a broad array of data from employment to education and political participation to social standing, the gender gap in Asia is there for all to see. And yet, the role of women in this region is changing under the pressures of economic growth and urbanization. For Asia to continue to prosper, though, the under-tapped potential of women must be unleashed. No one can dispute the strides Asia has made in bringing strong economic growth to the region over the decades. And yet, Asia continues to stand out for the relative neglect it shows to its greatest under-tapped resource: women. Asia is not without notable examples of women who have made it to the top in the political arena, but that does not mean the gap between male and female participation in politics is anywhere near being closed. With human trafficking a continuing problem in Asia, the international community needs to go beyond current ways of thinking and see trafficking from the perspective of the victim. Across Asia, the pressures of rapid economic growth and increasing urbanization are reshaping the way Asian women have traditionally defined. Muslim women in the Philippine state of Mindanao cope with the worst effects of the conflict there between insurgent groups and the government. Should North Korea Be Provided With Humanitarian Aid? Humanitarian aid is absolutely necessary to improve this devastating situation. Neither the South Korean government nor the international community can afford to ignore this serious humanitarian crisis. We must address, and convincingly answer, a fundamental question before we can even hope to craft a successful international strategy for redressing hunger in North Korea. Declassified CIA papers cast new light on South Korea's attempt to develop nuclear weapons in the 1970s and show that the program continued for at least two years after the US thought it had ended. Peter Warr argues that Thaksin’s politically motivated promises, including mega-projects, eliminating drug dealers and spending government funds to prop up rice prices, are unsustainable and don’t address core issues in Thai society. When ASEAN member states' foreign ministers gathered with counterparts from the US, China and Japan for a summit in July in Bali, many observers had expected the issue of maritime disputes in the South China Sea to dominate discussions. Reactions to the rise of China and its potential to dominate Asia have fueled debate in many countries over how best to respond. The world's media, and especially India's, were quick to pounce on the story of Kisan Baburao Hazare's recent, defiant fast against corruption in India, and the way in which it appeared to catch the government off guard. Asian manufacturers, which have underpinned the region's export-led growth, are not as prepared as they should be for shocks. South Korea is increasing its presence on the world stage with an assertive and effective role in combating piracy at sea in the Gulf of Aden and the Strait of Hormuz, two areas vital to Asian trade and energy supplies. The claim that North Korea is a mystery that defies explanation is a cliché amply supported by numerous newspaper op-ed pieces. Short reviews of The Shallows: What the Internet Is Doing to Our Brains by Nicholas Carr; Capitalism 4.0: The Birth of a New Economy in the Aftermath of Crisis by Anatole Kaletsky; Uprising: Will Emerging Markets Shape or Shake the World Economy? etc.